As an Associate member of Greenfield Hill Grange, the past few years have been full of worry, waiting, and wonder. The word was out that the beloved historic building and local Grange was at risk of closing…a call was put out to the community and all who enjoyed use of the Grange Hall, and we had a flood of new members! The welcoming ceremony was used as more than twenty new members joined in an effort to save our Grange. A year has passed, and as might be expected in any organization, some members have remained and become very active, some have attended and then are less active, and some try a few meetings and we don’t see them again. I suppose it wouldn’t be realistic to expect every new member to become an officer or fully active. But what can we do to encourage ANY new member to remain as a member, at whatever level is realistic for their interests and busy schedules? I will boil the answer down to three approaches…invite, include, and inform. Invite all members, old and new, to take officer or committee roles. Invite and welcome all new ideas for discussion. Invite all to attend other local and state Grange events to learn more about the organization and meet fellow members. Include and encourage all members in discussion of areas of importance. For months, we needed to address important issues of a new furnace, windows, lighting, rentals…it took us many months before we were able to move on to other topics, but all members felt we were jointly discussing items for OUR Grange. Include everyone with invitations to participate in the annual Fair, this is an area where members who cannot be active on a regular basis may join in and help. Inform all members about the many details of Grange rituals and activities. I have written a monthly “Membership Moment” which reviews our activities for those who could not attend, invites everyone to upcoming events, and explains opportunities that take place throughout the Grange year. These three suggestions could help members, old and new, to feel involved and committed to supporting their Grange for ongoing new projects and growth. We still need to focus on developing membership, but are working together to define who we are and where we want to go as a Community Grange. Shared projects, such as updating the Grange hall, Fair event, or community service, can be the foundation of developing involvement and promoting membership. 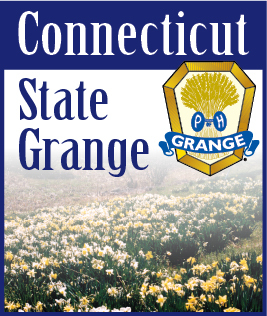 Sending you best wishes for all Connecticut Granges as we preserve the best of the Grange and welcome opportunities for new ideas and involvement.